Like so many artists Kokuta Suda was passionate about art from a very early age. His dream of becoming an artist was not shared by his father who did not support Suda’s choice of carrier. Academically he was one of the most gifted students at school. However during his teen years Suda suffered some serious issues with his kidneys, which forced him to take a leave from school and to move to Karuizawa, a well-known treatment resort for its clean mountain air. He suffered in a critical condition for three years, which gradually led him lose his enthusiasm for anything but painting. The beauty of nature in Karuizawa, in particular the view of Mt. Asama, convinced him to become an artist and this passion gave him a strong will to survive. He finally overcame the disease, however this life-threatening experience haunted him for the rest of his life, leaving Suda physically weak and insecure. Determined to become an artist, he tried to enter the prestigious Tokyo School of Fine Arts (Tokyo Bijutsu Gakko) albeit without success. He failed four times in a row. This setback, however, could be seen as a positive outcome as he could now work freely without the dogma of the establishment. According to Kotaro Nagahara (1864-1930), a professor of Tokyo School of Fine Arts at that time, Suda’s individualistic and eccentric drawing style was the main reason for the rejection. Despite knowing it could be a disadvantage for the entry exams, Suda was determined to stick to his own style and refused to follow any orthodox values. Acknowledging his talent, Nagahara suggested that Suda should move to America where his work would be better appreciated and the artist would be able to paint more freely than in Japan. Despite Nagahara’s advice Suda stayed in Japan and developed his own career. In his late-twenties Suda was obsessed with pieces of meat as a subject matter, painting it again and again over several years in an attempt to capture the essence of the flesh within his canvas. This odd choice of subject was not positively accepted by anyone except Manjiro Terauchi (1890-1964). This master of Western-style painting saw one of Suda’s paintings of meat in a local collective exhibition and was astonished by the intense power of the lines and texture. Terauchi encouraged this fledgling artist to vary his choice of subject matter. From this time, his works started to be exhibited at major group exhibitions annually, often receiving awards. While Suda started to enjoy his own success, his close friend and colleague Sadakatsu Nagafuchi was rejected for an exhibition. This rejection led Nagafuchi to commit suicide and left Suda with a great sense of guilt as he felt it was partly his fault due to his success in contrast to his friend. This tragedy was a great shock, taking Suda close to a nervous breakdown. In search of salvation and in a desperate mental state, he visited the Zen Buddhist temple Heirin-ji where he met the chief abbot Soetsu Mineo (1860-1954). After this initial meeting, he visited the temple regularly. Talking to Mineo and observing the monks’ rigorous practices, he eventually discovered peace of mind in Zen Buddhism. He was 29 years old and his mind began to open. Despite his traumatic experiences his encounter with Zen Buddhism allowed him to evolve and go to the next stage as a person and also as an artist. One year later at the age of 30 his work was accepted for the 1936 Bunten (later Nitten) Exhibition, the most highly regarded exhibition in Japan for the first time. Winning prizes at national exhibitions in the following years, he started to have a small following of collectors and also gained a patron who offered him a stipend. As Suda was not interested in selling his works or any commercial aspect, this basic support gave him freedom and allowed him to focus on developing his own style without concerns for finance or trends within the market. To seek out what he believed to be real art and get closer to his artistic goal, he struggled daily to impart his soul directly on to the canvas, with the hope of deeply touching or even enlightening the viewer. In December 1941 Japan entered World War II. Since having met Mineo at the Heirin-ji temple, Suda learnt about the historic temples in Nara and Kyoto. Facing the possible evanescence of the world surrounding him, his urge to see the ancient Buddhist images held in these old capitals became stronger and finally he moved to the Kansai region. Upon his arrival in Nara, Suda was captivated by the historically significant temples such as Todai-ji and Shinyakushi-ji and started to diligently paint the Buddhist sculptures kept there. He was befriended by Ryusho Fukuoka the chief priest of Shinyakushi-ji temple and was allowed to stay at one of the priests’ living quarters at the temple for two years, and following this he was given the use of a mud-walled warehouse in Kannon-in temple provided for him by Kaiun Kamitsukasa (1906-1975), a priest who later became the 206th chief abbot of Todai-ji temple. Using these free spaces in the temples as his studio and accommodation, he spent his days painting Buddhist artefacts. He was deeply attracted by the power of these sculptures, and tried to express their timeless vitality through his work. 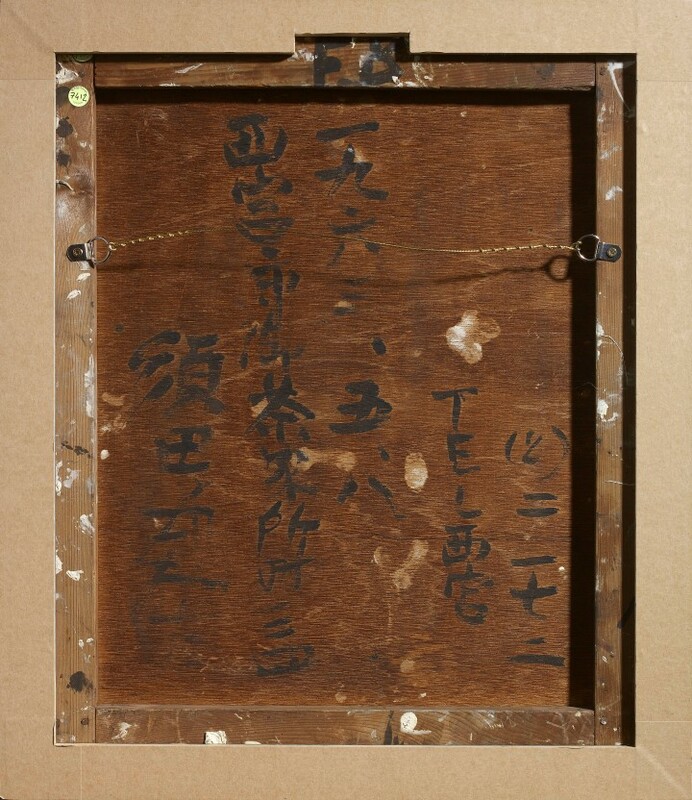 Despite the shortage of painting materials during the war, Suda kept painting even using Japanese paper and ink from temples, originally intended for sutras when needed. The war finally ended and the cultural circle Tempyo no kai was formed by Kamitsukasa. Believing that art and cultural activities were significant for a devastated post-war Japan, Suda took part and met many artists, photographers and novelists who gathered at Kannon-in which served as a cultural salon. As well as being inspired by these encounters, Suda also familiarised himself with Japanese traditional culture including Noh theatre and the tea ceremony, becoming more and more insightful. Unfortunately it was around this time that his sponsor died leaving Suda without an income. Fortunately for him he was invited to become a part-time teacher at an elementary school which would provide him with enough money to live as an independent artist. He was amazed by the freedom of expression and creativity of the children. Their works were much more powerful than that of adults and despite their rough lines the children’s drawings were very appealing. When he was teaching older students, he urged them to develop their own style, to be unique and different from the others, insisting on the importance of individuality. Throughout his life, he highly appreciated the powerful quality in primitive works and recognised similarities between Jomon pottery from 14,500 B.C and the lines drawn by children. He joined other artists in discussion groups in an effort to expand his horizons and in 1949, during an art circle talk, Saburo Hasegawa (1906-1957), one of the pioneers of Japanese abstract painting, suggested that Suda should study the teachings of the monk Dogen (1200-1253), author of Shobogenzo, the essence of enlightenment, literally translated as Treasury of the True Dharma Eye. Apparently he found it to be the most difficult philosophical text he had ever read. Fascinated by it and desperate to fully understand the ideas of the legendary priest he read this collection of essays repeatedly and intensely, which allowed him to look deeper into himself and to have a better understanding of the abstract qualities of Zen. A quality which he then tried to impart into his own work which now shifted from representational to abstract, inspiring him to express his inner thoughts into a concrete form. He was excited by this new way of expression. Suda studied the Shobogenzo for the rest of his life and found it to be a constant source of theoretical support for his abstract paintings which he began to work on in 1949. 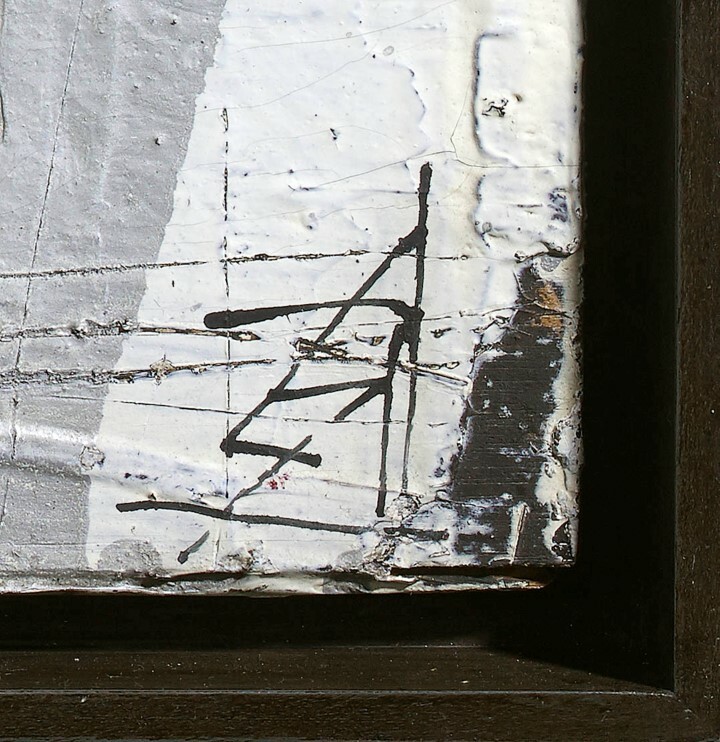 In 1950, Suda wrote his first essay on art which focused on calligraphy. This was published in Shonobi (Beauty of Calligraphy) sharing some important ideas with its main contributor Shiryu Morita (1912-1998), an avant-garde calligrapher and close friend of Franz Kline. By writing down his ideas, Suda steadily established his theory of abstract art. He thought that lines were a kind of global language and they were effectively a self-portrait of the calligraphers themselves. Suda paid special attention to lines from the beginning – some of his figurative paintings have a sculptural quality to them due to the presence of strong lines. As such it was natural for him to be intrigued by calligraphy as an art form. In 1955, he was invited by his friend and fellow artist Jiro Yoshihara (1905-1972) to join the new avant-garde group Gutai but he declined, preferring to stay independent in his creative process. His status as an artist in Japan rose and he was invited to show his work at overseas exhibitions. He represented Japan at the 4th Sao Paulo Biennale in 1957, followed by the 11th Plemio Resonne International Art Exhibition of Italy and Houston USA in 1959, then in the 1961 Carnegie International Exhibition, Pittsburg USA, and then on to West Germany. Suda continued in this vain until 1971 when he was asked to illustrate a new series of travel essays entitled Kaido o yuku (Going along the Road), written by the acclaimed author Ryotaro Shiba (1923-1996). Having focused on an abstract style for over 20 years yet never afraid to try something new, Suda returned to figurative representation but this time a trace of abstraction remained on his canvas and he enjoyed to mix both styles finding that abstract and representational paintings were not something contradictory and could in fact happily coexist. The collaboration between Suda and Shiba was a powerful one – the series with its brilliant text describing life in Japan during the Showa Period accompanied by the inspiring illustrations was a huge success and formed the beginning of a twenty year long relationship where the pair travelled extensively, first across Japan and then on to Korea, China, Mongolia and Europe. In total Suda produced 897 illustrations for the series, bringing him national recognition and fame. By this time he had improved his knowledge and technique of calligraphy and began using a thick young bamboo brush to express philosophical words with dynamic lines full of vitality. 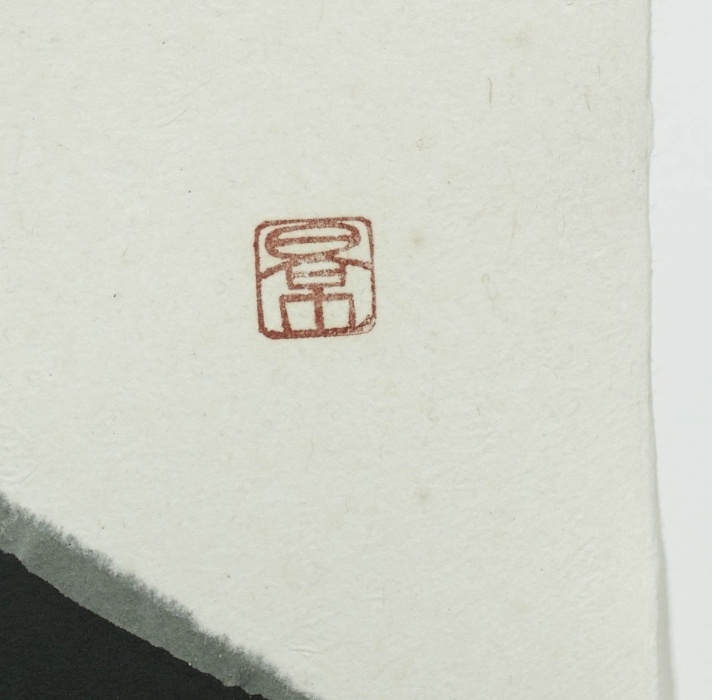 His obsession for the quality of the line, his talent as a painter and his strong spirituality soon brought him recognition as an outstanding calligrapher. 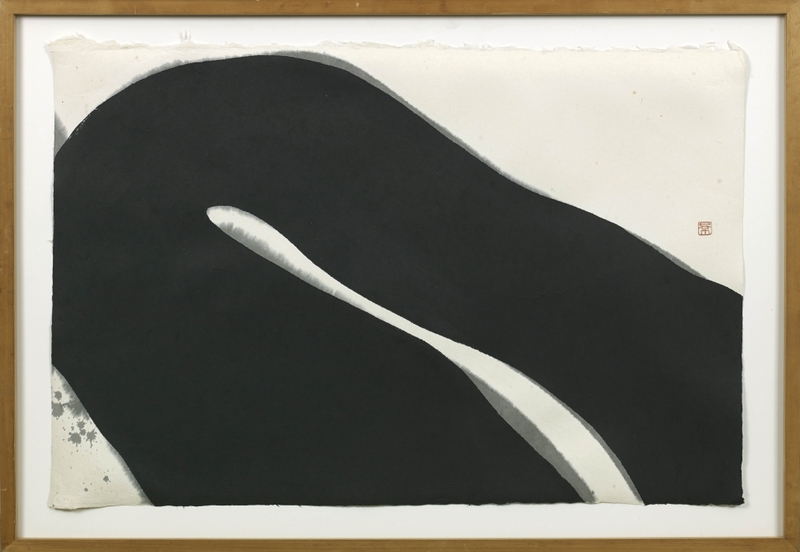 The eminent avant-garde calligrapher Yuichi Inoue (1916-1985) likened Suda to the old masters Hakuin (1685-1768) and Tessai (1836-1924), both renowned as calligraphers as well as painters. Throughout his life, he continued to pursue his own art with his pure and passionate character. When staying at the temples in Nara, the priest Kamitsukasa affectionately called Suda “Zenzai Doji” meaning ‘child seeker of truth’ in the Kegon sect of Buddhism and also “Kyojin Kokuta” which literally means ‘Madman Kokuta’. There are several episodes that would explain such character traits. When the new building material asphalt was introduced to Japan in his mid-twenties, the artist was instantly fascinated by this new road surface and even tried to steal some so that he might experience its qualities for himself. This lead to his arrest and several hours at the local police station. 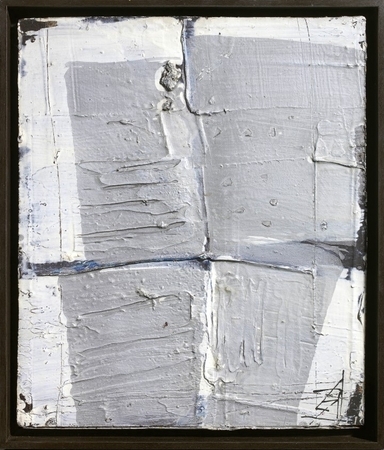 The thick sticky texture inspired him and similar qualities can often be seen in his work. Whilst living in Kannon-in temple in the mid-1940s, there was a heavy rain which continued for more than a week. Frustrated at not being able to go out and paint under natural light, he broke the mud-wall of his accommodation and painted under the light from the holes. Shiba, who knew Suda’s later life very well, often commented on Suda’s youthful appearance and pure child like qualities – at this time Suda was in his 80’s. At the same time, he had almost a priest-like spirit. Suda regarded his studio as a dojo, a hall where Zen Buddhists practice immersive meditation or a training hall for martial arts considered to be a sacred space of ritual importance. Indeed the studio was his spiritual battle field – he needed intense concentration to transfer his deep philosophy onto the canvas and to achieve breakthroughs in his creations. His painting process was intensely demanding both mentally and physically as he always pushed himself to the limit, trying to reveal his inner world and embody spiritual freedom in his work. He also continued to use the painful times of his youth as a powerful tool. His friend and fellow artist Kenkichi Sugimoto (1905-2004) once compared Suda to a live volcano which may be gentle in appearance but contains hot magma inside, a substance which holds an exceptional level of vitality and could fearlessly destruct any fixed value. In the last years of his life, he said that he finally felt he had mastered his chosen mediums of oil painting as well as ink. He spent his last days drawing from his hospital bed, putting all his final energy into this oeuvre. He died on the 14th July 1990 at the age of 84, after a life of single-minded dedication to the practice of art and the spiritual qualities within it. His work has an enduring, magnetic power and the embodiment of his philosophy still enlightens us today. Works by the artist can be found in the collections of: Saitama Prefecture Museum of Modern Art, Iida City Museum of Art, Nagano Prefecture; Osaka City, Sōgetsu Museum of Art, Gangōji Temple, Nara; Saitama Museum of Modern Art, Jakushū Itteki Library, Oi; Kahitsukan Kyoto Museum of Modern Art, Kyoto; L.A. County Museum of Art. SKU: 7412. Categories: modern/post-war, Paintings.